A small blue chip recovery on Vietnam's stock market helped benchmark Vietnamese shares rise after three days of losses that started on August 31. The benchmark VN Index on the Hochiminh Stock Exchange gained 0.45 percent to close at 556.81 points, while the HNX Index on Hanoi market lost 0.33 percent to finish at 76.32 points. Ma San Group (MSN) lifted the benchmark market, growing 4.5 percent after foreign investors bought more than 182,000 shares of MSN on September 4, equal to 70 percent of its trading volume. 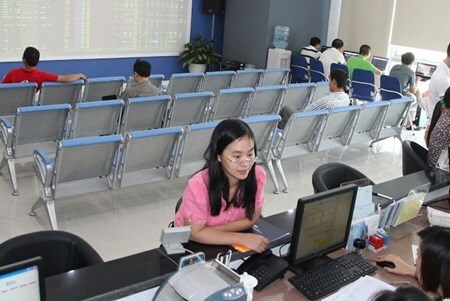 Foreign investors on the southern market on September 4 ended as net buyers after being net sellers for four consecutive trading days, while those on the northern bourse recorded a third day as net buyers. Foreign investors recorded a net buy value of 37.5 billion VND (1.67 million USD) on both bourses. Other large-cap shares on the southern market also rose to support the market. Among them, Bao Viet Holdings (BVH) gained 1.8 percent and Vingroup Corp (VIC) was up nearly 1 percent. Pha Lai Thermal Power Co (PPC) recorded a gain of 4 percent. Energy firms had strong growth, but a decline in global oil prices for the second day in a row dragged them down. West Texas Intermediate (WTI) closed at 45.56 points, a 2.5 percent decrease from the previous day. At the end of the day gas shares closed in mixed directions. Petrovietnam Gas Corp (GAS), Petrovietnam Drilling & Well Service Corp (PVD) and Petroleum Technical Services Corp (PVS) rose 0.4 percent, 0.6 percent and 1.5 percent, respectively. Most other energy firms on local bourses declined. Petroleum Construction Co (PVX) lost 3.23 percent and Petrovietnam Transportation Corp (PVT) was down nearly 1 percent. Market trading was quite low compared with previous days. More than 103 million shares were traded on the bourses, worth 1.45 trillion VND (64.5 million USD). On the HCM City market, Phat Dat Real Estate Development Co (PDR) was the most active stock with more than 4.1 million shares traded. PDR was down 0.63 percent at the end of the day.